– A husband and his wife kiss and lie back in bed (they are both clothed and the woman’s shorts reveals her bare legs to the upper thighs); the man begins to thrust and they are interrupted (please see the Violence/Gore category for more details). ► A husband and his wife wrestle in bed and tickle each other. A husband carries his wife over the threshold of a house. ► A woman wears shorts that reveal her bare legs to the upper thighs in a few scenes. A woman wears a low-cut nightgown that reveals cleavage in a few scenes. - A man hears a noise in his house and arms himself before going to investigate: he finds a broken picture frame, comes back down the stairs and sees a cat that hisses at him and a young girl slashes his Achilles tendon with a scalpel causing him to fall to the floor (we see the bloody wound as the ankle is severed); the child morphs into the man's wife and she tells him that they are suffering, and the child then stabs the man repeatedly (we see the very bloody body later). A young girl attacks her mother with a large knife, they wrestle and the woman's hand is slashed (we see blood) and she is stabbed in the side; she gets away and blocks the door preventing the child from getting in so that she can drop her young son from the window to her husband below; the girl gets into the room and stabs her mother in the back, and then in the abdomen twice killing her (blood spurts from the wound and we see blood on her shirt from previous wounds). A young girl stabs her father in the chest and holds the knife across his throat, he bites her arm and throws her, she kicks him and they wrestle as he holds her throat and tries to strangle her; she thrashes unnaturally, he holds a shovel over her throat and when he raises it, he is stabbed through the back and the pointed weapon comes through his chest and he falls dead (blood is shown on his shirt). ► A young man is wheeled into a medical facility and we see he has a very bloody head wound (his brain is exposed), blood spurts from another wound and a doctor clamps it as he tries to treat the patient; the young man dies and the doctor tries to perform CPR with no effect (a large puddle of blood has collected on the floor), lights flicker and the doctor turns around to see the patient sitting up and talking to him until someone else enters the room. ► A young girl hits her father over the head with something knocking him out and when he wakes up he sees a large smear of blood on the floor. Several children play hide and seek with a man, one young girl walks into a road to greet her cat as a large truck speeds along the road and a young boy runs toward the road; the man snatches the boy out of the way of the truck as it jackknifes and the girl is struck off-screen and killed; we see her limp body on the ground and her mother collapses with bloody hands after finding her. A young girl puts a tray of food in a dumbwaiter and sends it to the second floor where her infirmed sister will retrieve it; we hear dragging on the ceiling above and a loud thump when the waiter slams back to the first floor and when the child opens the door we see a spilled tray of food and a crumpled body in the shaft. ► A woman hears sounds in an attic and whirring mechanical noises shake a wall and sink in a bathroom where she opens the medicine cabinet and sees her crumpled dead sister. A woman imagines seeing thick blood pouring out from behind the doors of a dumbwaiter. A woman imagines being in a bed where her limbs are twisted and her bones are gnarled (we hear cracking as her bones twist more) and she sees gray-tinged fingers pulling open a dumbwaiter door. ► A man digs up the body of his daughter and takes her to a burial site where he places her in a shallow grave and covers her with dirt. Two men take a dead cat into dark woods to a pet cemetery and one man digs a hole to bury it; the other man tells him to follow him and they climb a tall wall of sticks and limbs, walk through dark woods and through shallow water and up narrow steps (thunder rumbles and lightning flashes in the sky) where they bury the cat in a shallow grave and pile rocks on top of the body, and then leave. ► A young girl walks into dark woods alone and finds a cemetery with many markers in the ground; she tries to climb a large wall of piled sticks and limbs that surrounds the burial area and falls when a man startles her, telling her to get down (we see her with a spot on her leg that we are told is a bee stinger and the man pulls it out and places a mud patch on it). Several children wearing animal masks walk through dark woods; one child beats on a drum and another child pushes a wheelbarrow with a dead dog in it (no wounds or blood are seen). While becoming amorous a husband and his wife are interrupted by their cat eating a bird on the foot of their bed (we hear slurping); the couple is startled and we see the bird twitch its wing indicating that it is still alive as the man picks the cat up and carries it out of the room (we see blood on the bird and the bed). Two men look at a dead cat on the side of the road (we see bloody wounds and blood-matted fur). ► A man tries to euthanize a cat and it scratches him and hisses; we then see the man take the cat away and leave it near dark woods. A husband and his wife tell their young daughter that her cat ran away and the girl points to her closet and says that he is in there; the father opens the closet and the cat hisses loudly and bares its teeth (we see blood-matted fur). A young girl tries to brush her cat's badly matted fur and the cat hisses and scratches the girl (we see bloody slashes on the girl's arm). A man hears voices in the wind from dark woods, he hears a voice behind him and he follows the voice into the woods, and walks to a pet cemetery and the man tries to climb a tall wall of sticks and limbs but a hand reaches through the sticks and grabs his leg (he wakes up in bed). A man follows his cat into a basement and walks toward a dark passage where he steps into a road and falls back just before being struck by a speeding truck. A young boy cries in his crib pointing to something that he saw (we see that he is seeing a dead young man with bloody wounds and his partially exposed brain). ► A young girl lies in bed with her father and she asks him, "I'm dead aren't I?" A young girl speaks to her father and asks "Where am I?" and we see that she is smudged with dirt, her skin is tinged gray and one of her eyes seems swollen. There are several scenes that show a young woman in a bed wheezing as she breathes with twisted limbs and bones protruding from under her skin. A young boy draws a picture of something with blood coming from its head (it is perhaps a cat). We see a drawing of a tall demon with large horns in a book about Native American lore. A man puts a sedative into a glass of whiskey that another man drinks and he passes out shortly after drinking it. ► A woman has panic attacks and hyperventilates in a few scenes. Mourners are gathered at a funeral and we see a small casket being lowered into the ground. A man in a car sits distracted at a stop sign, he then pulls forward into an intersection and is nearly struck by a speeding truck. A large truck speeds on a narrow, two-lane road in a few scenes startling a family with young children. Opening credits are accompanied by an aerial view of a dark wooded road, a house in flames, bloody handprints in a car, and bloody footprints and smears of blood on a porch. A young girl goes into a man's house and looks around, she finds a hand gun in a drawer and is startled when the man confronts her for being there. A young girl dances and spins around wildly, knocking things off tables and breaking them; she yells and her father yells at her to stop. A young girl hugs her mother and the mother is unable to return the affection. ► A man talks about his dog dying when he was a boy and that a man buried the body in a place that brought the dog back to life, but it was changed and when it went for his mother, his father had to "put it down." A man talks about his wife having died and that she got sick. A man talks about working the "graveyard shift" at an ER. A man reports to work at a medical facility and is told that there is a patient with a bloody nose (we do not see it). A man talks about a place that "feeds on your grief." A man tells another man that he can "undo" what he has done. A young girl says, "Mommy doesn't want me here. That's OK, I don't want her here." ► A man tries to brush his daughter's hair and he finds a series of surgical staples on the back of her head. A doctor examines a patient and says he will run a test for Strep. A husband and his wife talk to their young daughter about death and the woman tells her that after we die, our souls keep on living and the husband disagrees. A woman talks about her sister being jealous of her because her spine wasn't twisted like hers. - A man puts a sedative into a glass of whiskey that another man drinks. Three people drink wine with dinner, two men drink beers, a woman drinks a glass of whiskey, and a man pours two glasses of whiskey and two men drink. A man smokes in his house and we see the smoke and the glow in a few scenes, and a man smokes outside in a few scenes. - Death, life after death, love, heaven, death of a loved one, truth, Native American burial grounds, rituals, folk lore, grief, second chances. 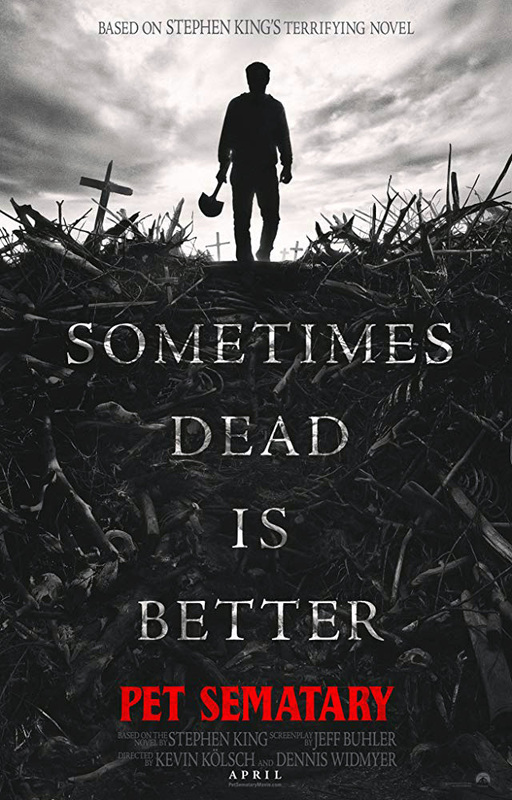 - Sometimes allowing the dead to stay dead is better for everybody involved.